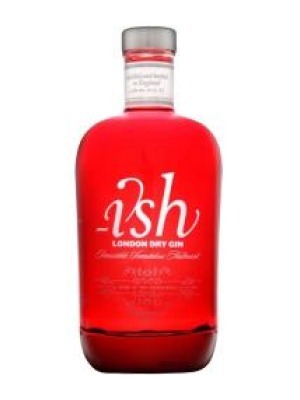 Ish London Dry Gin is a popular Craft Gin available from DrinkSupermarket.com in 70cl to buy online. Visit DrinkSupermarket.com for the best price for 70cl of Ish London Dry Gin or compare prices on our other Craft Gin products. Hand crafted in small batches inthe heart of London and made from all British grain, -ish Gin is distilled in a traditional pot still by the Master Distiller whose familyboasts the longest history of ginmaking in the UK. Using the highest quality grainspirit, -ish is infused with thetaste and aromas of its elevenselected botanicals including juniper, coriander seed, angelica root, almond, orris root,nutmeg, cinnamon, cassia, liquorice, lemon peel and orange peel. The botanicals are maceratedin the spirit for 24 hours before being distilled five times andthe resultant concentrate is thenallowed a two-week restingperiod to allow for the botanicals to become fully integrated. The ratio of -ish concentrate to alcohol and water is higher than average, providing a more complex mouth and body. Where to buy Ish London Dry Gin ? Ish London Dry Gin Supermarkets & Stockists. You can buy Ish London Dry Gin online in most retailers and find it in the Craft Gin aisle in supermarkets but we found the best deals online for Ish London Dry Gin in DrinkSupermarket.com, TheDrinkShop, Amazon.co.uk, and others. Compare the current price of Ish London Dry Gin in 70cl size in the table of offers below. Simply click on the button to order Ish London Dry Gin online now.